In this review we are talking about top 10 cheap quadcopters that can be purchased for less than $100. The drone industry is developing extremely fast and remote controlled drones aren’t just for children any more. New inexpensive drones are coming to the market with new features and at cheaper price and the percentage of adult enthusiasts is increasing. Today it is easy to find and buy an affordable quadcopter and soon everyone will own a drone. Many people also use drones to shoot amazing video footage or to market their businesses. Purchasing a drone for under $100 will ease your mind if you think you will be clumsy at flight, and are concerned about your drone gets a few scrapes and scratches. Your choices are nearly endless so we bring you a list of top 10 quadcopters under $100 to help you decide what’s the best affordable quad for your needs and budget. Many pilots claim that Syma X5C1 is one of the best inexpensive quadcopters with camera. Syma X5C1 is the upgraded version of the Syma X5C and it is probably the most inexpensive quad with camera. It is a highly recommended RTF inexpensive quad and one of the most purchased in the market. This drone is ideal for indoor and outdoor flight. It comes with 2MP camera and the camera is easily unmountable. The drone is equipped with 7x20mm four motors. These motors give the enough power to transport small lightweight objects when the camera is removed. The X5C1 comes with Li-Po 3.7V 500mAh battery that allows 6-8 minutes of flight time, depending on how hard you fly it. You can remove prop guard, landing gear and camera once you learn how to fly this quad. This way the quad will lose some weight and flight time will increase while motility will be much better. For a beginner outdoor RC drone under $100, the Syma X5C1 makes for an excellent choice. The upgraded Syma X5C-1 quadcopter is so stable that your mother could fly it! It's the perfect first quadcopter for beginners. It's also fun for advanced flyers. JJRC drones are known for their high control range and today we review H26W, JJRC’s FPV drone. JJRC are one of the most innovative manufacturers producing inexpensive quadcopters and they have been producing amazing drones in the last couple of months. Because of its size and being a bit nosy, the JJRC H26W is mainly an outdoor drone. 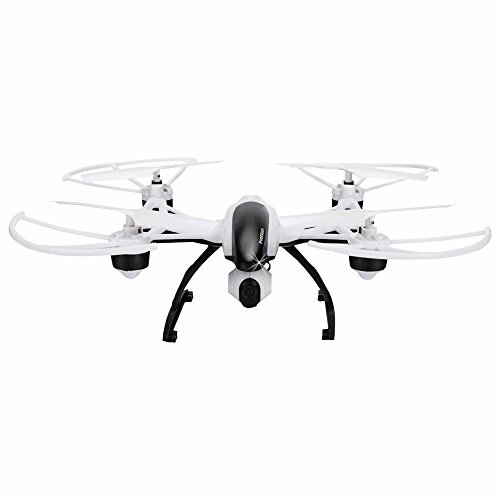 This drone includes two very helpful features, One-Key-Return and Headless Mode. This drone is also capable of performing the 360º aerial stunt trick with just the press of a button. It comes with a 2MP camera with fairly good image recording quality and a 2-axis adjustable gimbal. This feature means that you can tilt the gimbal in four directions – right, left, upward, downward, allowing pilot to acquire different angles of view. On top of all that, the JJRC H26W delivers about 300 meters of control range and live video transmission too. FPV (real time video) transmission is done via Wi-Fi directly to your phone or tablet. The H26W streams to your device through a free to download application available for both iOS and Android. The JXD 509V isn’t too big drone and is only slightly larger than its transmitter. This drone comes with 3.7V 600mAh Li-Po battery that allows about 10 minutes of flight time. It also comes with a VGA module camera with decent image quality. The camera is ball shaped and attaches to the bottom of the drone and can tilt 30º angle. This feature allows flyer to acquire different angles of view. The JXD 509V is packed with amazing features and if you want a good drone with helpful features this is it. These features include Headless Mode, Altitude Holder and One-Key-Return. The only negative side of this drone is the fact that it only has about 80 meters maximum control distance. The MJX X400 is packaged in an RT state. The drone’s design is both elegant and ultimately very distinctive. It is equipped with the LED lights that serve a great deal when flying in night mode. The most amazing feature of the MJX X400 is the FPV real time transmission. 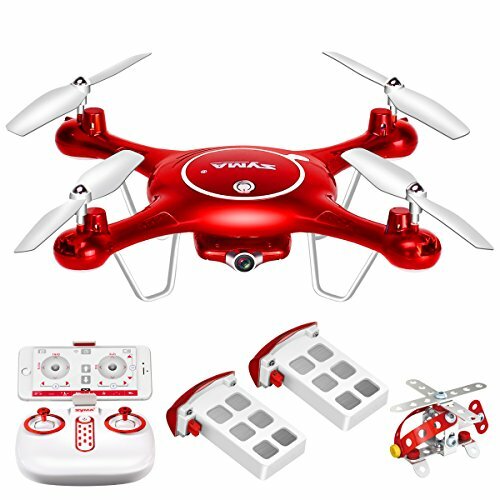 This drone comes with a Wi-Fi 0.3MP FPV camera that connects to your Android or iOS Smartphone through a free application. This enables you to see what the drone is recording directly on your phone screen. With a built-in camera that shoots photographs, the MJX X400 can give you an all new perspective of family events, parties and sports. This is an incredible feature for a quad of this price. The drone is equipped with 3.7V 750mAh Li-Po battery that allows 8-12 minutes of flight time while recording and transmitting FPV. MJX X400 Drone for Experts and Beginners, Really! This is one of very few quadcopters that's suitable for beginners yet in now way will bore experts. Extremely stable in beginners mode, perfect for learning to fly. The Syma X5UW is one of the most popular entry level drones and it is also one of the better looking drones in this price range. It comes with a really cool metallic paint job, sleek body style and a video game inspired remote control. It should survive most of your crashes because it has a very durable frame. 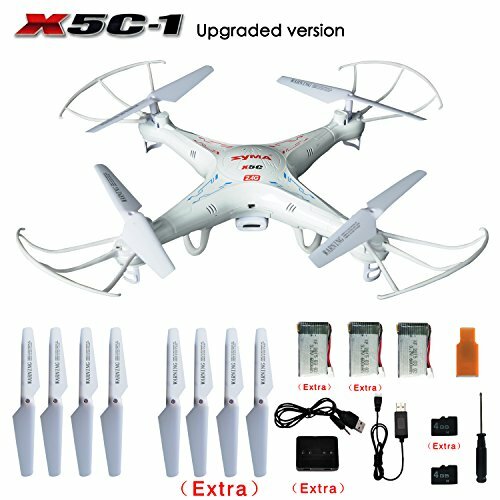 The X5UW is not one of the most stable drones on the market. However, it becomes very fast on maximum yaw rate once you get the hang of it. The problem is that, on high rates, its motors can be a bit noisy. 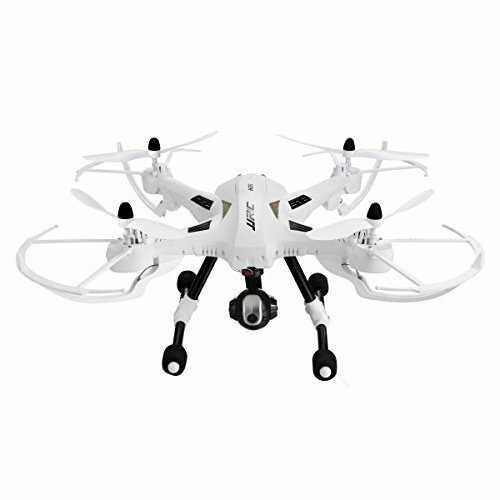 This drone comes with some amazing features, such as Altitude Hold (quad maintains height by itself, allowing user to focus on the video), FPV (First Person View) and mobile application control. The quad has a control distance of 80 meters. This is average and similar to other quads in this price range. The Syma X5UW comes with a 3.7V 500mAh battery that provides about 6-10 minutes of flight time. You can remove camera and prop guards after you catch flying basics. You can also remove landing gear too, but the quad may look strange without that. This way weight will reduce and you will get more flight time and motility will be much better. You can fly this drone both indoor and outdoor. However, indoor flights are not recommended for newbies until they are able to fully control the drone. The indoor flights are also not recommended because of the fact that the Syma X5UW is not a small drone. This candy apple red camera quadcopter is a very smooth flier with altitude hold. It should be great for beginner fliers. Try coupon code SYMAX5UW for $15 off! 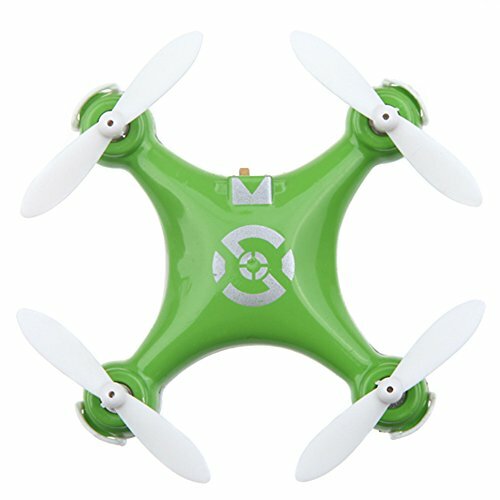 The Cheerson CX-10 is a perfect beginner RC quad. The Cheerson CX-10 line is not only unbelievably cheap, but it is also incredibly light and small. The weight of this tiny drone is about 12 grams and the dimension is 4.2 x 4.2 x 2 cm. This makes it probably one of the world’s lightest and smallest FPV drones with altitude hold and it is designed for indoor use. Because of its tiny size this drone is not equipped with a camera. It has LED lights and plastic casing. The CX-10 has a built-in 6-axis system, despite its tiny size. This feature makes minute gyroscopic adjustment to keep the drone stable in the air. This drone is quite durable but newbies should invest in prop guards to help protect their drone and allow it to last longer. An amazing feature about this drone is that it comes with three different Flight Modes. The Flight Modes are beginner, intermediate and advanced mode. Beginner mode offers lower sensitivity and thus lower manoeuvrability. This makes it perfect for pilots who are just starting out. On the other hand, flying on advanced mode allows you to move fast, but it can be quite sensitive. For this reason you should only switch to this mode if you know what you are doing. The CX-10 comes with a 3.7V 100mAh Li-Po battery that allows you to fly your drone for 4-8 minutes in the air. The battery takes about half an hour to charge completely. Inside the box you’ll receive the drone, a USB cable, a transmitter, two spare rotors, and a manual. The UDI U818 drone is a lightweight model that comes ready to fly right out of the box. It is well suited for flight both indoors and outdoors. However, outdoor flight on mild-weathered days is not recommended because of its size. Its maintenance is easy and the parts are simple to replace. This drone comes with a camera that captures both still images and video footage. The UDI U818 comes with a black casing and four big circular protective blade protectors. The built-in blade guards keep the rotors from getting damaged. Also, should you wish to fly this drone indoors, they will protect your furniture and walls. The controller has a four channel function, allowing for simpler control. This drone is also equipped with a 6-axis gyro system with posture control to help keep it stable in the air. You can fly this drone out to a maximum distance of 30 meters and it is capable of performing 360 degree flips. It comes with Li-Po 3.7V 500mAh Battery that takes 120 minutes to completely charge up. Inside the box you’ll receive the drone, remote controller, 4GB Micro SD Card, USB card reader, battery charger, battery, 4 spare blades, screwdriver and a user manual. The main reason why anyone would want to buy the WL Toys V636 is its flight performance. This drone is very smooth and stable. However, when the need arises it is still capable of some truly aggressive flying. This drone has a slightly different look than other drones. The body is smaller, with bigger blades. It has a silver metallic body with black and green markings. The V636 is also equipped with LED lights that look sophisticated. These lights can help you to see the quad at a distance. The V636 doesn’t come with a camera but it comes with a controller that has an LCD screen. The blue LCD screen at the bottom of the controller helps you manage the controls. With the optional propeller guards you will be able to fly this lightweight quad indoors. 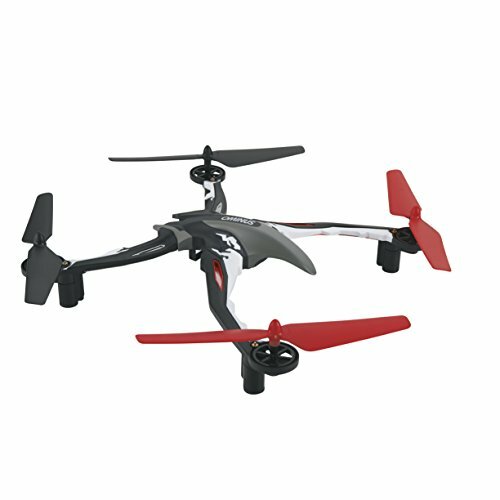 The V636 makes for an excellent trainer drone and it is considered to be one of the best under $100 drones in the 240mm size category. The JJRC H31 is considered to be one of the most affordable and yet longest distance drones available for this price. The H31 is RTF (Ready to Fly) drone. However, you need to attach the landing gears and mount the propeller protectors prior to your first flight. The H31 is a simple quad and it does not have many features. However, it is a nice beginner friendly drone with a control distance of about 150 meters. 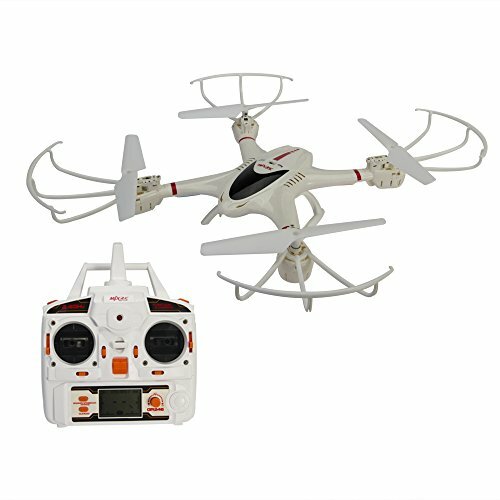 Because of its amazing flying performances and high stability, it is one of the most sold cheap quads. This drone comes with good landing legs and prop guards. You should be able to fly it indoors because it is small size and has a prop guard. Many pilots report that they were pleasantly surprised by both design and build quality of this drone. Inside the box you’ll receive the drone, remote controller, bonus sunglasses, battery, USB charging adapter, spare propellers, landing gears, propeller guards, screwdriver and a user manual. The Hubsan X4 is extremely suitable for all age groups and experience levels. 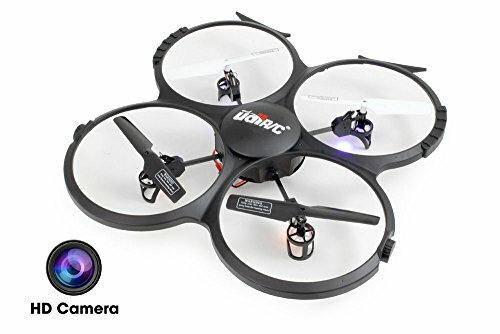 It’s very stable in the air, particularly indoors and that is one of the reasons why this drone is recommended for beginners. This drone has the potential to fly fast and aggressively. However, if you want it can also be flown conservatively. The first thing you’ll notice about this drone is its tiny size. 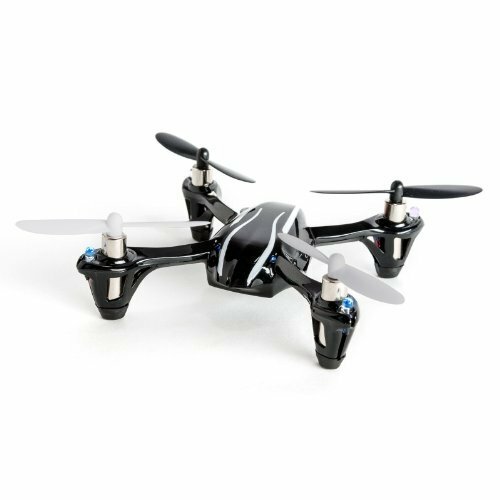 The Hubsan X4 weighs about 28 grams so you shouldn’t try to fly it outdoors if weather conditions are not optimal. The drone has an all-black coating with a pair of white streaks along both sides of the body. 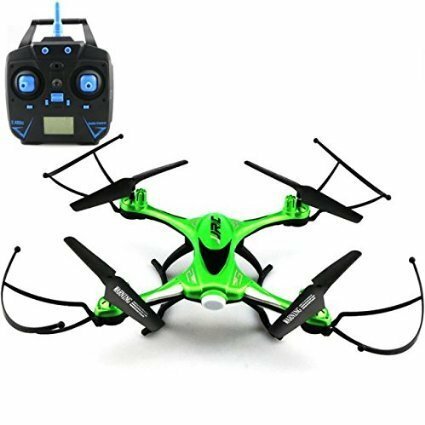 However, in case you want to be able to see your drone at a distance, there are other color choices, such as black with red, black with green or green with black blades. Also, LED lights and painted propellers make it simple to determine quads position when in air. The Hubsan X4 is equipped with 3.7V 380mAh Li-Po battery that only takes around half an hour to recharge. Each charge will give it around 6-8 minutes of flight time. The battery is built-in and not removable. This drone also comes with 1MP unmountable camera. This is pretty unusual for cheap micro quads. Another amazing feature on this drone is that there is a stunt mode button. This allows your drone to perform rolls and trick in the air. This is also unusual feature that comes in this price range. These are all very powerful and yet cheap drones. You can choose the most viable drone to fit your needs now that you know the specifications and features of each of top 10 most affordable quads to purchase.